Who among us has never wondered if there might not really be a tempter sitting on our shoulders or dogging our steps? C.S. Lewis dispels all doubts. 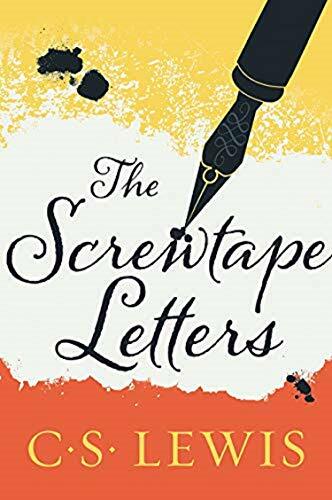 In The Screwtape Letters, one of his bestselling works, we are made privy to the instructional correspondence between a senior demon, Screwtape, and his wannabe diabolical nephew Wormwood. As mentor, Screwtape coaches Wormwood in the finer points, tempting his "patient" away from God. Each letter is a masterpiece of reverse theology, giving the reader an inside look at the thinking and means of temptation. Tempters, according to Lewis, have two motives: the first is fear of punishment, the second a hunger to consume or dominate other beings. On the other hand, the goal of the Creator is to woo us unto himself or to transform us through his love from "tools into servants and servants into sons." It is the dichotomy between being consumed and subsumed completely into another's identity or being liberated to be utterly ourselves that Lewis explores with his razor-sharp insight and wit. Sent July 12th to Laura0141 in Glasgow! I love it when the books travel far. I have *finally* finished this! I enjoyed this book although I had to keep reminding myself who the 'Good Guys' were and found it very confusing at the beginning as I didn't know anything at all about it. It's an excellent concept and very well written. Will be going to nice-cup-of-tea when I have money to post it. Really enjoyed re-reading this CS Lewis classic. The book reminds us that there are many paths too hell, not just the obvious ones! Lewis writes with intelligence, compassion and honesty. Sorry, forgot to do the release note until now! oops forgot to journal this collected it at the July bc meeting at the stamford arms has now entered the relms of mount toobie read for reading and releasing in the future. This finally made it's way to the near suface of mount toobie so grabed it. This is not the quick read that you think that it will or should be but it definitely one of those that makes you think and contemplate between sections. A very thought provocing read. This book has now moved to the relms of mount toobies husband mountain slightly further along the range will get him to journal in due course.